My generation is commonly referred to as "The Nostalgia Generation," and with good reason. We are the last generation to have had a childhood free of the intrusiveness of smartphones and tablets, but our teenage and adult years have become dominated by them, allowing us an interesting perspective which, coupled with a collective insecurity regarding our futures in the current socioeconomic climate (times are tough, y'all), means that at a young age, we long for what we perceive to be simpler times. 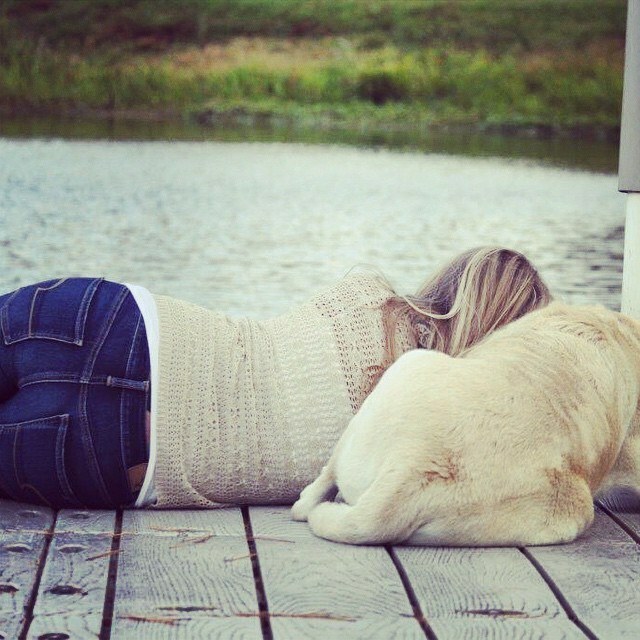 Because there is such a decisive split in our lives, we love to reminisce, if it can even be called that, revisiting the things we loved a mere 10 years ago. Thankfully, services like Netflix offer instant nostalgia in the form of beloved movies and TV shows that defined our lives before Apple took over the world, and this month, they added an under-appreciated classic to its roster: "Animaniacs," Steven Spielberg's loving ode to Looney Tunes and a show that merits revisiting by everyone, not just the nostalgia-obsessed. It is, in a word, genius, a meticulously crafted cartoon that, while a children's show in the most technical sense, is so saddled with adult humor, pop culture references, rapid-fire vaudevillian jokes and musical numbers, and pastiches of actual, refined culture (in the form of parodies of Gilbert and Sullivan musicals, the films of Ingmar Bergman, et al.) that it transcends the confines of children's humor and borders on a show that is admirable in its blending of presentation (a fast paced, high energy cartoon) and content. 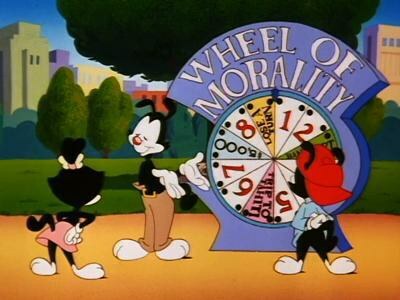 The "Wheel of Morality," which offered gems like "early to rise and early to bed makes a man healthy but socially dead." At the risk of sounding emotionally stunted, this show has only gotten funnier in the many years since I last watched it, due mainly in part to the fact that the many, many jokes which had gone over my head as a child are now accessible, while still being fresh nearly two decades after first airing. In one musical number about the elusive and ephemeral nature of fame, Yakko and Wakko, the two "Warner brothers and the Warner sister Dot," rhyme "Sardi's" with "Vince Lombardi's," a clever (and admittedly elitist) line in a brilliantly written song which is but one of five years' worth of a steady barrage of guffaw-inducing, intelligent jokes. In an age where so much of entertainment geared towards kids is nauseatingly saccharine and ingratiatingly anodyne, it's comforting to know that there is a show that can and has withstood the ravages of time and can educate children, however indirectly, while making adults laugh out loud; a mildly-racy masterpiece that is, most importantly, funny. Rewatching it now, it becomes baffling that this show was created as a Saturday morning supplement for children. Names and characters like Schopenhauer and Marlon Brando are dropped and parodied so frequently that it would almost seem implausible that this show ever found an audience with children, but the Marx Brothers-esque slapstick and colorful (literally and figuratively) irreverence perfectly demonstrate its still-impressive versatility. Pixar might sprinkle a little adult humor in their movies to make them bearable for parents, but only in "Animaniacs" would you find a psychiatrist yelling at the three leads to "stop playing with [the] bust" on his desk, followed by one of them blowing a kiss to the audience and saying "goodnight everybody!" I have to admit that It's difficult for me to remain impartial regarding this show as I re-watch it because I've come to the realization that it, along with "The Simpsons" (my parents were very lax about what I watched), afforded me my first realizations of the power of culture in our society, from Shakespeare to Seinfeld. Going back to my old proverbial stomping grounds has served as some kind of cathartic experience, explaining my dream of being a cultural critic and my love of a good (read: bad) Groucho-ism. 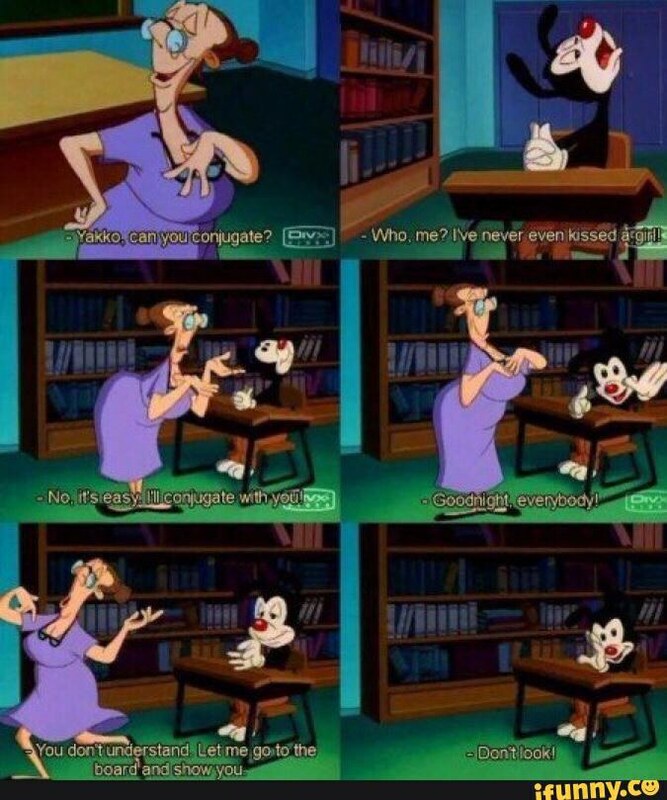 My reversion to the entertainment I loved as a child has fully explained the goals I've set for myself as an adult, and because I owe so much of the development of my own personal taste and interests to this show, I will be forever grateful to the collective genius of Steven Spielberg, Yakko, Wakko, and Dot.